Praised as a “fine stand-in for an orchestra” by the Washington Post, pianist Hyejin Kwon, hails from Seoul, South Korea. 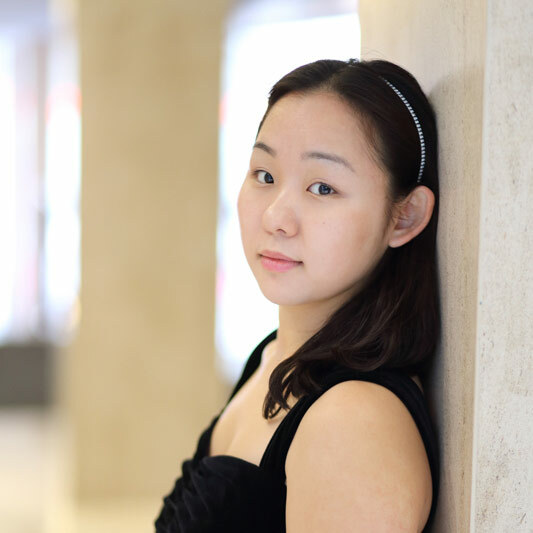 Ms. Kwon began studying piano at age four, made her first public debut at age seven and her orchestra debut at age 11. She moved to the United States at age 15 to attend the Interlochen Arts Academy in Michigan. She won the MTNA Concerto competition in 2004 and was also featured on Interlochen Public Radio. Ms. Kwon graduated from the Peabody Institute of Music of the Johns Hopkins University in 2009, with her Bachelor’s degree in Piano Performance, and in 2011, with her Master’s degree in Vocal Accompanying. She also served as the pianist for the Johns Hopkins Medical Institute Choral Society from 2008 to 2011, then as their musical director from 2011 to 2012. before joining Lyric Opera Baltimore as their répétiteur and the Repertory Theater of Washington as the music director. She also served as a Vocal Accompanying Fellow at Aspen Music Festival, and as an apprentice coach at Opera on the Avalon and St. Andrews by-the-sea Opera Workshop. Ms. Kwon moved to Canada in the fall of 2012, and has been actively working as a pianist, coach, répétiteur, and a music instructor. She recently completed an operatic répétiteur diploma program at the University of Toronto and joins the Canadian Opera Company Ensemble Studio for their 2015⁄16 season as an apprentice coach.